Yesterday was opening day in Major League Baseball. Yahoo! 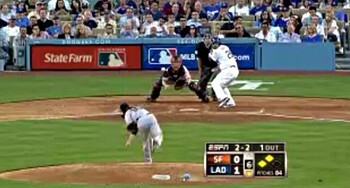 I watched bits of Tigers v. Yankees, Padres v. Cardinals, and much of the Giants v. Dodgers game, all on my iPhone. I haven’t subscribed to MLB.tv, but yesterday’s games were sponsored by Volvo, so anyone with the MLB 11 app could watch for free. The quality is reasonable, and the app seems smart about not consuming all the available bandwidth. I root for the A’s, Giants and Phillies (and favor the Tigers and Cubs when there are no other rooting interests). All three are pretty good teams, and all of them have the starting pitching to contend, but may have trouble scoring runs. The A’s have no power threat and a cadre of fragile, replacement-level position players, the Giants need a good season from Posey, Sandoval and rookie Brandon Belt, and the Phillies are hurting without Werth and Utley. But however it turns out, it’s great to have baseball back.